The WTW5200VQ model from Whirlpool is sold at adequate price and comes with various features to tempt homeowners. Dimensions include a height of 43 inches, width of 27 inches and depth of 25 ½ inches. The unit features Super Capacity plus, allowing it cu. ft. capacity of 3.5 per load. The Xtra Roll Action Plus Agitator is designed to allow for the maximum amount of loads while exposing them to maximum cleaning. The model also features a Quiet wash noise reduction system. Read below for a more comprehensive overview of the product. - It comes with Super Capacity Plus. - It allows for three water levels. - It comes with four water temperatures. - It features the Xtra Roll Action Plus Agitator. - It comes with White Porcelain Wash Basket. - It comes with various cycles including Normal, Casual and Delicate. - It allows for an on and off Extra Rinse option. - It comes with Quiet Wash Noise Reduction System. - It comes with a Fabric Softener dispenser. - It features a bleach dispenser. The one thing to love about this model is its Super Capacity Plus which allows for a large amount of load each time. The Xtra Roll Action Plus Agitator also ensure that each fabric is given due attention. This feature basically brings the laundry to the bottom of the machine where cleaning becomes more effective. With this feature, the WTW5200VQ Whirlpool model can take care of roughly twice the usual load. A fabric softener dispenser as well as a bleach dispenser is also made available in the unit. 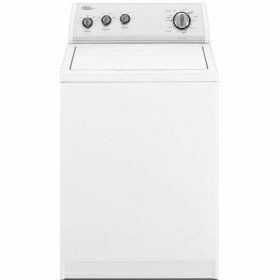 Unlike other washer models, this unit has a Quiet Wash Noise Reduction system that allows for minimum sounds when operating. An on and off extra rinse option is also an added feature. A porcelain wash basket is added which resists scratches, stains and odor while at the same time protecting clothes from being damaged. Cycles include normal, casual and delicate to complement each wash type. The unit also allows for various temperature choices as well as three water levels. This model is not energy star certified and does not have child lock features. Also, settings such as end of cycle signal, add bleach signal, delay start, extra spin cycle and soak settings are noticeably absent. The unit is also non-portable. The model also lacks a lint filter and reversible doors. Cycles like the hand wash, permanent press, pre wash cycle and stain wash are also not available with this Whirlpool model.